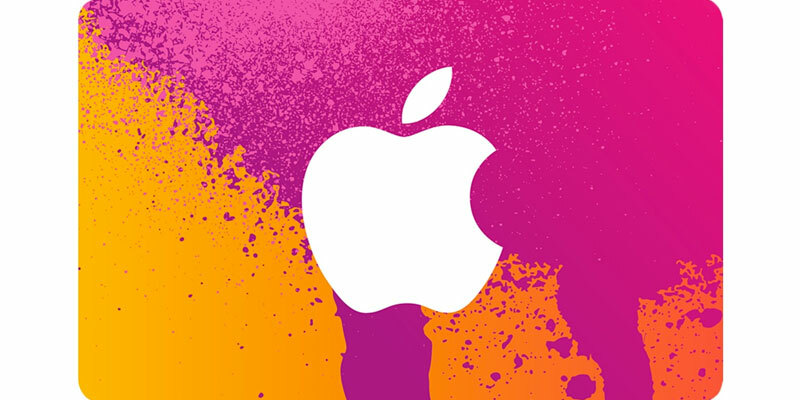 iTunes gift cards is a scheme that Apple has introduced for its customers to buy music from the Apple store. When it started, it could be first viewed through their Facebook page, but now you can easily purchase from the iTunes store. They are fun to use once you know how to use them on your iPhone and iPod. 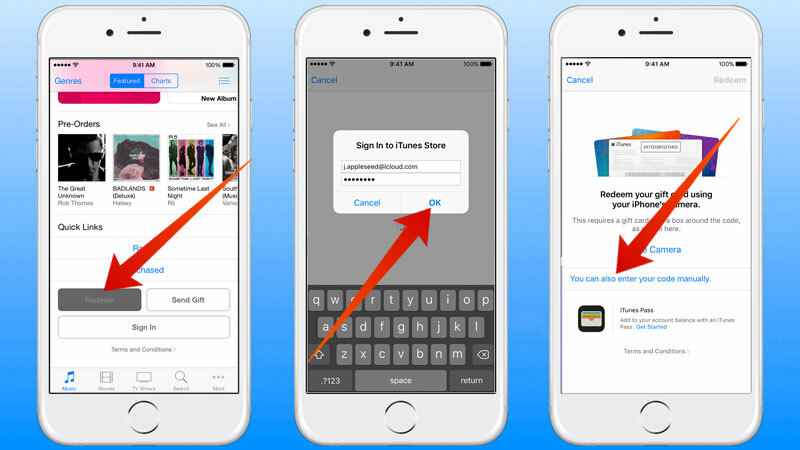 Read on to learn how to redeem iTunes gift card on iPhone or iPad easily. The gift cards usually come around the occasions or holidays. Depending on how much you are ready to spend, you can buy them from as low as $15 and can go up to $100. You can even plan to gift them as well to someone near to you are using Apple products. You can easily order them from the iTunes store. They would be duly packaged and shipped to the receiver in 24hrs. But don’t worry if they are not aware of redeeming the card. Here are some simple steps that can help you learn how to redeem the gift certificates. All they need is the latest version of iTunes and uninterrupted internet access. Go to the iTunes store on your Apple device. Once you are the screen, scroll down till the end of the featured section. You would find a redeem option there. Tap Redeem. 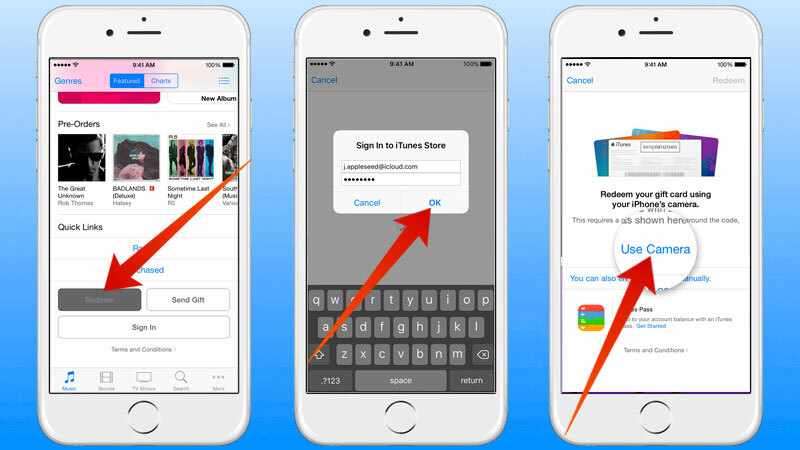 You would now be required to sign in with your Apple id. Now enter the gift card code mentioned on your gift card. Bingo! You can now use the credit points to buy music, movies, and books. Redeem gift card using the camera on your Apple device. You have both the options here; you can use the black box around the code, or you can even enter it manually. If you are using your camera, then hold the back of the card in front of the camera. It would read the code automatically, and you can see that your iTunes store has balance. For manual redemption, follow the steps above. Remember one thing that these gift cards can only be used to purchase single songs. You won’t be able to able to buy complete albums by using them. Also, it is recommended to buy gift cards with your credit card or your PayPal account to avoid any issues. Don’t use other gift cards to buy iTunes gift card because many retailers would not let you do this.